Check spelling as you type, or not? Choose here. 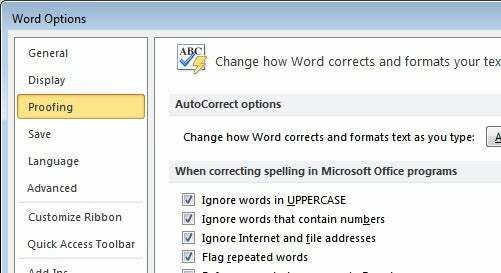 You use Word’s spelling checker every day, and probably just as often encounter some of the tool's puzzling behavior. Do you know how to get rid of a word that you mistakenly added to its dictionary, for instance, or how to hide the red wiggly lines that appear all over your document? The following ten tricks will help you to work more efficiently in Word 2010, and they will even make you and your documents look smarter. Word can determine whether you've butchered the French language. If you use an obscure word often, you can get Word to stop flagging it. Choose File, Options, Proofing, and click Custom Dictionaries. Click the custom.dic file--or the name of the dictionary to add the words to, if you are using a special dictionary--and click Edit Word List. Type a word, and click Add. When you’re done, click OK to exit the dictionary. Oops! Added a misspelled word to the Dictionary? Choose File, Options, Proofing, and click Custom Dictionaries. Select the default dictionary in the list; typically this is the custom.dic file. 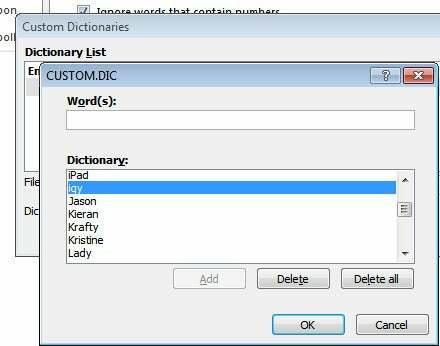 Click Edit Word List to open the custom.dic dialog box, which contains a list of words you have added to Word’s custom dictionary. Scroll down the list, click the errant word, and then click Delete and Close. In the future, if you use this misspelling in a document, Word will properly flag it as a mistake. You can configure Word so that it doesn't report URLs and other special items as misspellings. 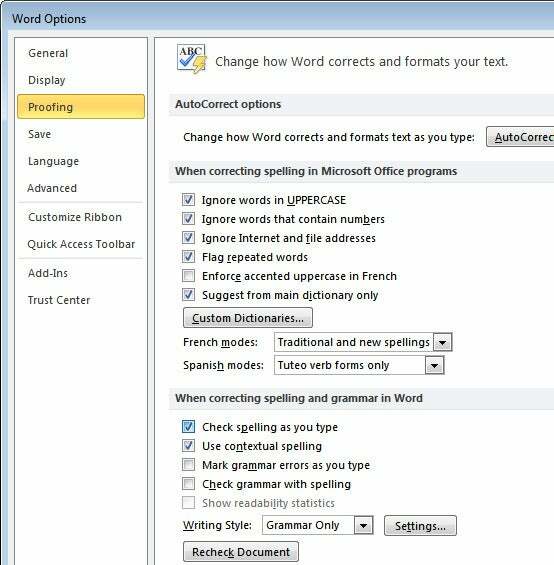 To see the preferences that Word is currently configured to use, choose File, Options, Proofing. Here you can set preferences, such as 'Ignore words in UPPERCASE' and 'Ignore words that contain numbers'. If you don't want Word to report email addresses and URLs as misspellings, for example, click to enable the Ignore Internet and file addresses checkbox. You can also disable Flag repeated words if you find Word's highlighting of repeated words annoying. When you are done, click OK to return to editing the document. These changes apply instantly, and will remain in place even after you shut down and restart Word. Hide the lines that identify a misspelled word on a document-by-document basis. If you like to work with 'Check spelling as you type' enabled, but wish to hide the wiggly underlines for one document only to reduce distractions, you can do so. This feature lets you control the visibility of the wiggly lines on a document-by-document basis, without disabling the spelling checker itself. Choose File, Options, Proofing. Within the 'Exceptions for:' group of options, make sure the current document name appears in the box, and click Hide spelling errors in this document only. Click OK, and the document will stop showing wiggly underlines. You can still spelling-check the document, of course, by clicking the Review tab on the Ribbon toolbar and selecting Spelling & Grammar, or by pressing the shortcut key, F7. Make sure Word leaves your programming code alone. 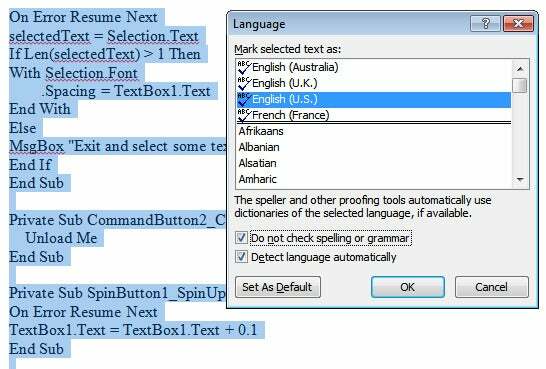 Computer programming code, scientific data, and other specialized text often includes words that don't live in Word’s dictionary, so the spelling checker frequently flags them. To disable spelling checks for such situations, first select the text in question. Then click the Review tab on the Ribbon toolbar, and choose Language, Set Proofing Language. Click the Do not check spelling or grammar checkbox, and click OK. Word will no longer proof the selected text, now or at any time in the future. Many businesses have their own language. For example, a doctor's office uses medical terminology, and a mining office uses mining jargon. If your business uses certain industry terms, it's convenient to have a dictionary of those terms on hand, to prevent Word from flagging them as misspellings. Create a dictionary of terms that are special to your business. You can either add the special terminology to your own custom.dic file or create a second dictionary file of the specialized terms. Maintaining a second file can be beneficial, as you can share it with other users without sharing your own personal custom.dic or needing to overwrite the other user's custom.dic file with your version. To create a second dictionary, choose File, Options, Proofing, and click Custom Dictionaries. Click New, type a name for your dictionary file, and click Save. Now you can add words to the dictionary as detailed in Tip 3 above. If you are using two dictionaries--both custom.dic and a second one of specialized words--you'll want Word to use words from both files when it makes suggestions for correcting the items it has flagged as spelling errors. To make sure that Word is configured to do this, click File, Options, Proofing, and confirm that the option Suggest from main dictionary only is disabled. If not, disable it and click OK.
Let someone else use the word list you've built. Once you've created a dictionary file, you can share it with other users so that they can employ it in their version of Word. To do so, in Windows Explorer, locate the .dic file you created, and then send the recipient a copy. The other person, on their computer, will need to place the file in the same folder as their own custom.dic file. Then, to add the file to Word, the recipient should launch Word and choose File, Options, Proofing, Custom Dictionaries and click Add. The user should then locate and select the new .dic file, which will be in the folder that the dialog box points to, and click Open to add it to Word's Dictionary list. In some situations you may find yourself using a word that's correctly spelled but incorrect in the context. Homophones, such as stationary and stationery, or advice and advise, can be confusing--all the more so because the spelling checker won’t always flag their misuse. In addition, if you tend to overuse a word, you may want Word to alert you so that you can change it on certain occasions. A solution to both issues is to exclude the problematic words so that the tool will flag them. Do you tend to confuse 'advice' and 'advise'? Word can warn you. To exclude one or more words, you must add them to the Word exclusion file, which is already created for you and installed with Word 2007 and 2010. Start by searching for ExcludeDictionaryEN*.lex using Windows Search. In the search results, you will find multiple files, one for each English variant. The four-digit code in each filename tells you which .lex file belongs to which language variant. For example, 0409 is for the United States, and 0809 is for the United Kingdom. See Microsoft's site for the IDs for each locale; look for the number in the LCID Hex column to identify the files for the language variants you use. In Windows Explorer, open the folder containing the exclusion files, right-click the ExcludeDictionaryEN*.lex file for the first language variant you use, and choose Open With, then WordPad. Type the words to exclude, one per line, and click Save. Repeat for any other language variants that you use. Close and reopen Word. In the future, when you type any word that's in the exclude dictionary file, Word will flag it as a spelling error. Take care to click only 'Ignore Once'--not 'Ignore All' or 'Add To Dictionary'--to move past the word when you're using the 'Spelling and Grammar' dialog box. Otherwise, the spelling checker won't flag the word as a misspelling in the future.